If you are intimidated by the idea of using an online calculator to create a few financial projections you won’t feel that way after you go through this post. We’re going to explore this exciting world together! We’ll look at how you can use these puppies to get a quick snapshot of where you stand financially and what your financial future might look like. The cool thing about this process is that it’s not that complicated if you can put your fears aside for a bit. We only need to understand a handful of ideas. Let’s get crackin’. Let’s assume you are going to retire in 10 years, have $100,000 saved now, you’ll add $10,000 a year until you retire and assume that you’ll earn 6% on average. Now let’s address question #1. I then selected “Calculate” and got the result of $348,032. That means if I invest $100,000 now and add $10,000 for 10 years, I’ll have $348,032 assuming I earn 6% on average. You see how simple this is? Fun…huh? I knew you’d dig it. Want this done for you? Let me know. Now that you’ve answered the first question, it’s time to tackle the second half of the problem – how much income will your investments provide over your lifetime? Since we estimate the value of our investments will be $348,032 that is the number I plugged in for “Starting Capital”. I assumed a 6% return so I used that for “Growth Rate”. Then I plugged in 30 for the “Years to Pay Out”. Here I am assuming that is how long I’ll live. Then I noted that I want the payments to begin at the start of the year. 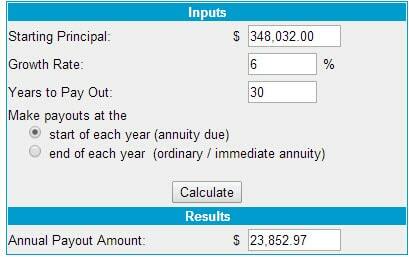 The result is $23,852.97 – that is the amount I can withdraw every year over 30 years based on a 6% return. 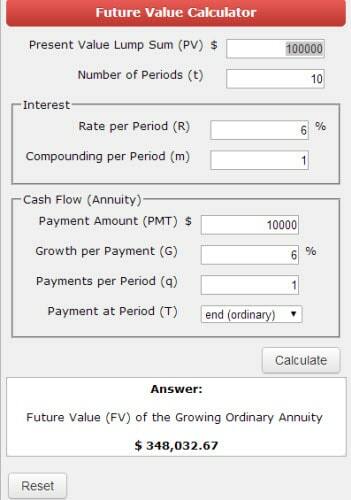 In order to use online financial calculators, you have to make assumptions about the future. For our purposes, we had to make assumptions about the return and how long we’ll live (number of years). Obviously it’s impossible to really know either of these values with certainty. Still, if you use reasonable numbers and you are conservative you can easily use these calculators to provide a quick and free bird’s-eye view into what your financial future might look like. This exercise gives you a great “big picture” view of your finances as I said. However, this isn’t meant to give you individualized financial advice or create a comprehensive plan. To do that, you need to dig a lot deeper. At a minimum, you have to determine how much money you’ll need down the line and how much you’ll be spending when you retire. Even then, online calculators can only take you so far. That’s because they only show you what the picture looks like at one point in time. But once you retire, your situation will continue to change. Your cost of living will continue to change and your investments might shift too. None-the-less, you can use these calculators to get an important overview of where you stand financially. Are you in? Why or why not?